More demand for grazing cattle, whilst heavier sorts are reflective of the current beef prices. Co Down producer, 420k, £1,010; 385k, £935; 455k, £1,000, J N Tierney, Dungannon 545k, £1,180; 520k, £1,050; 500k, £1,035, S Mitchell, Eskra 545k, £1,170; 560k, £1,180; 475k, £1,000, William Doherty, Strabane 530k, £1,120; 540k, £1,090; 590k, £1,190, A Keys, Clogher 535k, £1,120, O Donnelly, Dromore 545k, £1,130, D Maguire, Urney 650k, £1,340, D McKinney, Fintona 540k, £1,090; 560k, £1,120, R J Rankin, Castlederg 540k, £1,080; 465k, £950, Patrick Kelly, Carrickmore 490k, £1,150, S Doherty, Killeter 420k, £910; 450k, £945, K Ward, Mullaslin, 460k, £990, R Donnelly, Dromore 405k, £860; 460k, £945; 385k, £795, S Cassidy, Tattyreagh 405k, £830, K Quinn, Strabane 460k, £940, C Hannigan, Fermanagh 485k, £990; 495k, £985, J Patterson, Drumquin 450k, £900 and J M Rodgers Beragh 345k, £785 (3). P F Ward, Mullaslin 535k, £1,135; 545k, £1,130; 435k, £995, M McAleer, Pomeory 570k, £1,175, T Quinn, Sion Mills 550k, £1,115, J R Lowry, Burndennett 510k, £1,020; 445k, £920, S Pinkerton, Baronscourt 505k, £1,005; 440k, £910 and £890, J and T Meenagh, Carrickmore 410k, £915; 320k, £840; 335k, £840, S Doherty, Killeter 485k, £1,060, Paul Hawkes, Omagh 450k, £900; 310k, £670, B Gormley, Claudy 490k, £970, S Keenan, Greencastle 605k, £1,190, S Jones, Gortaclare 630k, £1,225; 650k, £1220 and Hume Brothers, Artigarvan 585k, £1,125. P McGrath, Melmount, 490k, £165, D Downey, Dungannon 570k, £157; 530k, £152, T Quinn, Sion Mills, 680k, £151, M McWilliams, Carrickmore 750k, £147; 640k, £135, D Maguire, Urney 670k, £141, P Horisk, Errigal 620k, £137; 590k, £132, K McSorley, Trillick 740k, £137, W Doherty, Strabane 660k, £136, P H Kirk, Plumbridge 710k, £136, K Quinn, Strabane 690k, £135, S Pinkerton, Baronscourt 690k, £133 and D Hamilton, Donemana 730k, £131. S Porter, Kilclean 690k, £120; 630k, £112, W J Hamilton, Castlederg 680k, £113, P Fox, Creggan 730k, £112, J Henderson, Trillick 640k, £109 and P V McCullagh, Greencastle 780k, £109. A selection of calved heifers and cows exhibited by Messrs Anderson, Newtownstewart recorded top prices of £2,250; £2,150; £2,000 and £1,980. 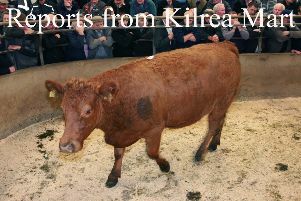 R Graham, Trillick £380 Limousin bull; £325 Hereford bull, J A Morris, Newtownstewart £375 Limousin bull; £300 Limousin heifer, S Patterson, Fecarry £370 Aberdeen Angus bull, K Warnock, Trillick £360 Limousin bull, P McNamee, Douglas Bridge £345 Aberdeen Angus bull, C Keatley, Aghyaran £320 Belgian Blue bull; £295 Belgian Blue heifer, P Cassidy, Castlederg £325 and £295 Limousin heifers, Foyle View Farms, Strabane £330 Limousin bull; £295 Limousin heifer, C Turner, Drumquin £320 Hereford bull, D Beattie, Omagh £315 Simmental bull; Des Cummins, Mountjoy £300 Aberdeen Angus bull and C McFarland, Beragh £280 Hereford heifer. D Stewart, Ballinamallard £770 and £740 Aberdeen Angus bulls; £585 Aberdeen Angus heifers, K Lynch, Castlederg £740 Charolais bull, Boa Island producer, £650 Hereford heifer, T Fyffe, Drumlegagh £600 Belgian Blue heifer and W J Johnston, Ederney £640 and £600 Limousin bulls. Sale of wintered suckled calves: 300 calves on offer met keener demand with prices generally £30 to £40 up on the previous week. D Walsh, Altnagelvin 305k, £805, E McGirr, Ballygawley 335k, £860, P McNabb, Drumquin 315k, £790; 340k, £800, J P McBride, Plumbridge 330k, £820, N McGarrity, Carrickmore 300k, £740; 305k, £730; 406k, £870, F Campbell, Ballygawley 400k, £975; 400k, £940, V Laughlin, Gortin, 330k, £800, G Hegarty, Strabane 305k, £740; 260k, £640, C Nicholas, Plumbridge 355k, £835, J Patterson, Drumquin 415k, £975; 485k, £1,015; 410k, £865, M McNabb, Dromore 420k, £950, Jas Gormley, Belleek 420k, £950; 400k, £860; 350k, £845, T Flanagan, Belleek 205k, £635; 300k, £705; 375k, £880, M McCoy, Dromore 250k, £690; 280k, £750; 265k, £695, K Young, Castlederg 245k, £660; 320k, £705; 375k, £8520, S McGinn, Trillick 530k, £1,090, B Burns, Trillick 525k, £1,065, S Reid, Drumquin 390k, £855 and H Carleton, Ederney 380k, £820. N McGarrity, Carrickmore 435k, £950; 350k, £825, S Reid, Drumquin 385k, £915; 385k, £895; 360k, £830; 370k, £845, J Gallagher, Newtownstewart 295k, £765; 315k, £770; 340k, £795, R Donnelly, Dromore 330k, £325k, £760, Jas Monaghan, Ederney 345k, £820; 370k, £810; 395k, £840, J G Kelly, Strabane 375k, £865, D Chambers, Dromore 340k, £780, M B Coll, Drumquin 335k, £765, P Horisk, Errigal 330k, £750; 350k, £775; 315k, £695, J Surphlis, Trillick 380k, £865; 400k, £860, Moy producer, 370k, £840; 335k, £790, W Evans, Lack 340k, £745, M Mullan, Mullaslin 365k, £795, K Cassidy, Ederney 3275k, £800, M Carland, Mountfield 285k, £700, W P Eves, Kesh 290k, £645 and William Irvine, Kesh 290k, £660.